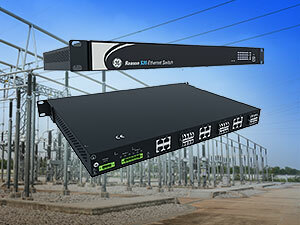 GE is pleased to announce the latest release of the Reason S20 series managed Ethernet switches, now enhanced with Layer 3 functions and cyber security features in accordance with NERC CIP v5 requirements. The Reason S20 are now Layer 2 and 3 managed Ethernet switches, capable of packet switching between intelligent substation devices when routing is necessary. In addition, this firmware (07A00) delivers supervisory monitoring enhancements and a new order code with licensing mechanism for Layer 3 capabilities and IEEE 1588v2 PTP support. This release also builds on the cyber security features released previously, enabling the S20 to deliver a comprehensive set of cyber security features that enable operators to comply with the latest NERC CIP guidelines and regulations.